In a previous post (Red Red Wine) I wrote about the Sagrantino di Montefalco wine and the erstwhile pleasure of our visit to the Arnaldo Caprai winery set in the verdant Umbrian countryside. 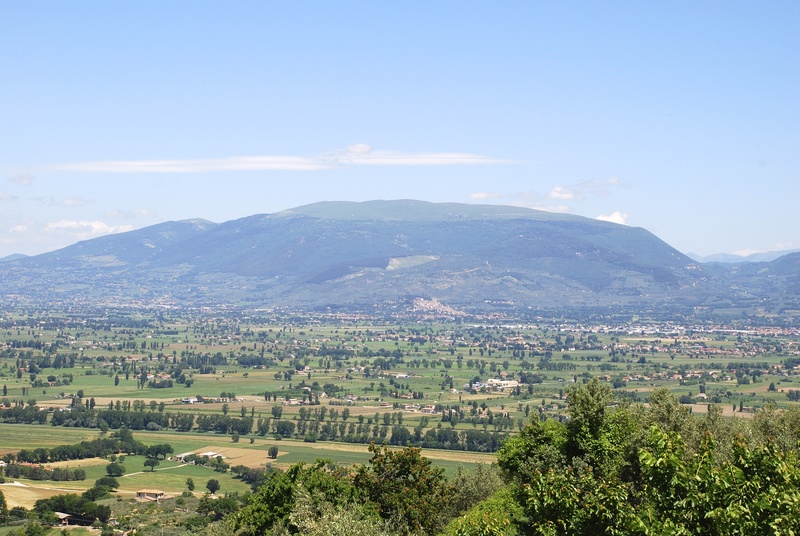 At the centre of the Sagrantino wine region sits the small town of Montefalco, perched high on a hill and enclosed within medieval walls. 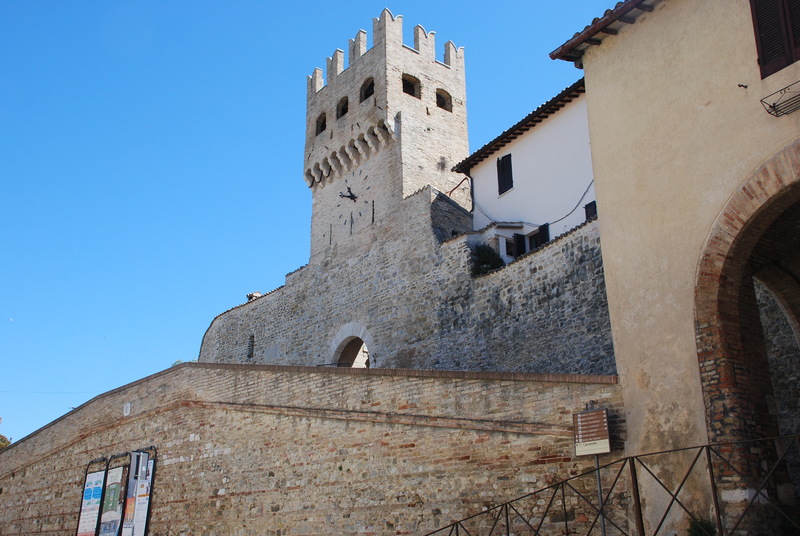 The walls are pierced by 5 gates, and from each gate a narrow road winds upwards to the main square, Piazza del Comune, at the summit of the town. The Piazza is almost perfectly circular, and around its perimeter stand a number of grand buildings. 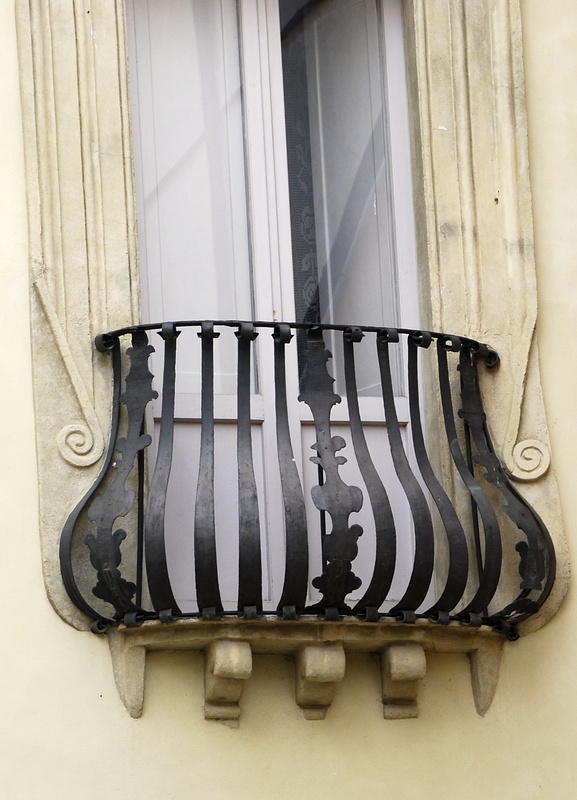 The Palazzo Comunale dates from the 13th to 14th centuries, although it was restored in the 19th century. It is an imposing building with beautiful, crisp brickwork. Tall, thin and elegant, the former church of San Filippo Neri, built in the 18th century, is now a theatre. 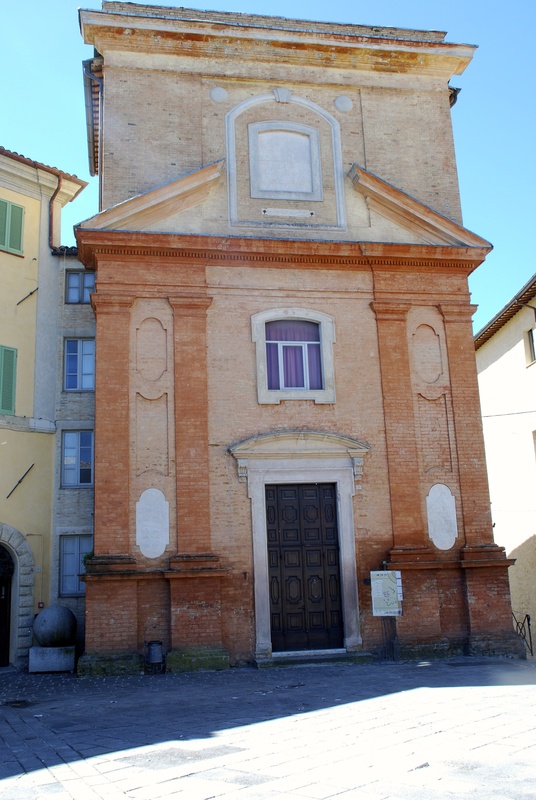 The tiny Oratorio di Santa Maria was used to hold public meetings during the Renaissance. 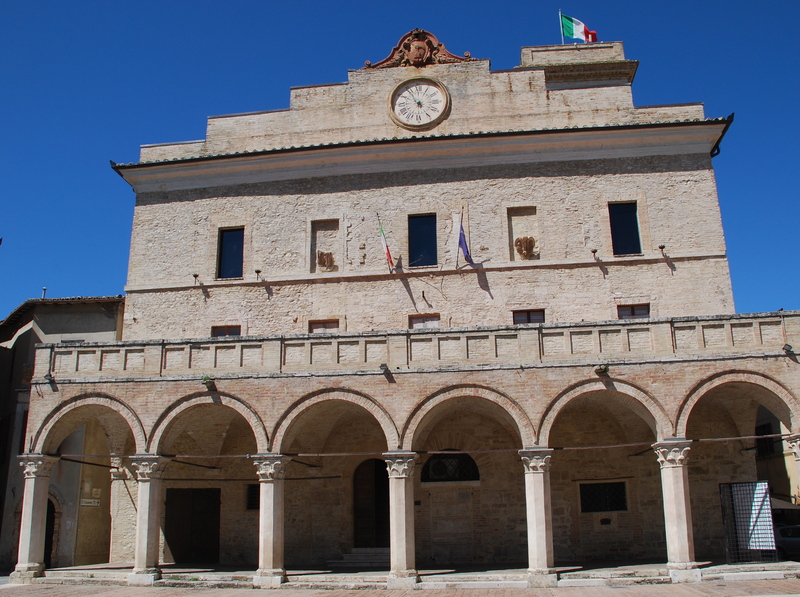 It has some original frescoes and copies of other key paintings held in Montefalco’s museum and churches. Just as well, since the “no photos, even without flash” policy is common. 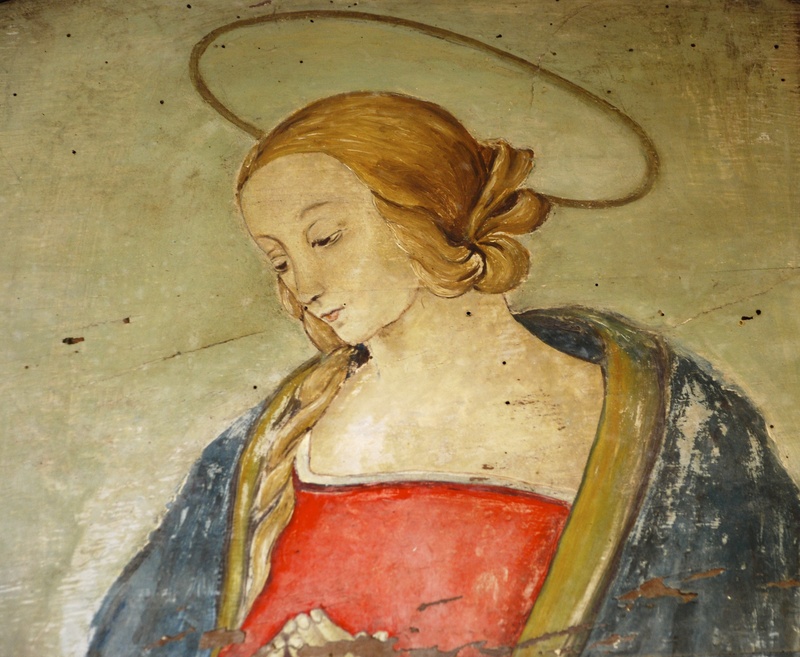 Detail from a painting in Montefalco’s museum, reproduced in the Oratorio di Santa Maria. Leaving the square, we visited the church of Saint Francis and the attached monastery which now form part of a small museum which is renowned throughout the region. The museum houses a number of interesting paintings, largely by Umbrian artists including Francesco Melanzio from Montefalco. 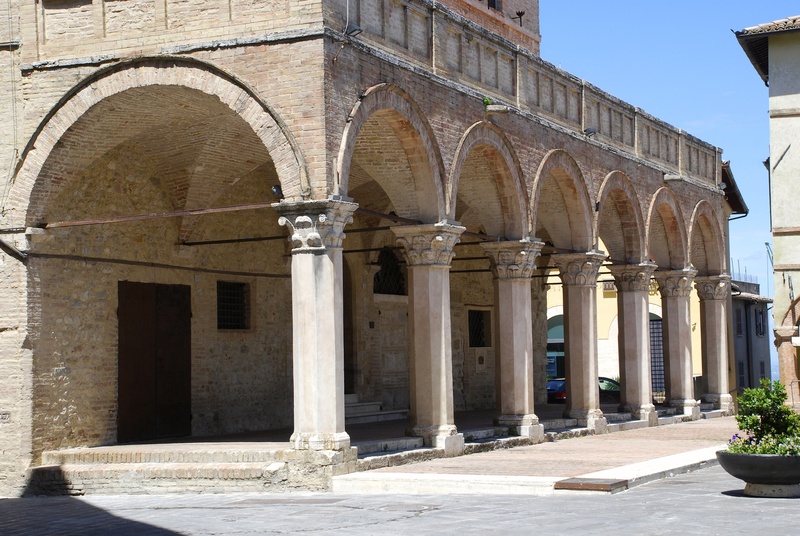 There are also some artefacts – ceramics, wooden statues, glass from Murano for example – and the ancient cellars of the Friars Minor of Montefalco, containing an enormous wine press! The highlight of the museum is the former church itself. 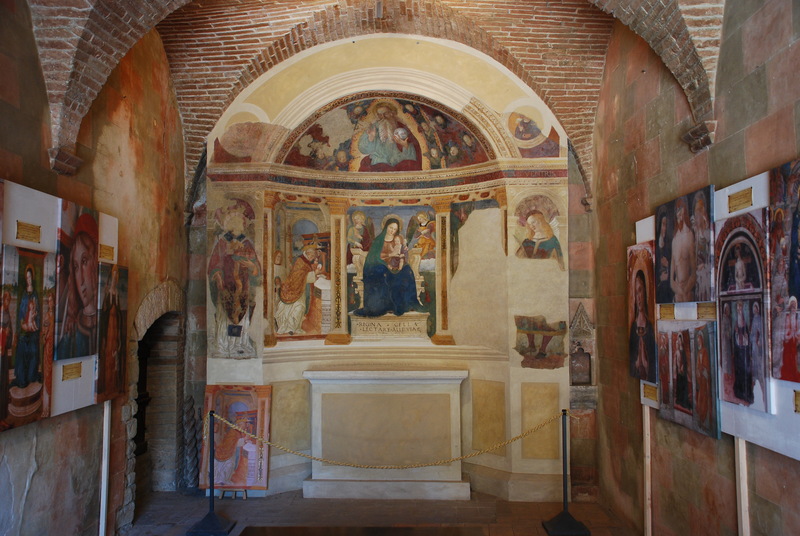 Built as a Franciscan church in the early 14th century, it houses a cycle of frescoes by Benozzo Gozzoli depicting the life of Saint Francis of Assisi. In terms of their subject matter, these frescoes are considered second only to those in the Basilica di San Francesco in Assisi. 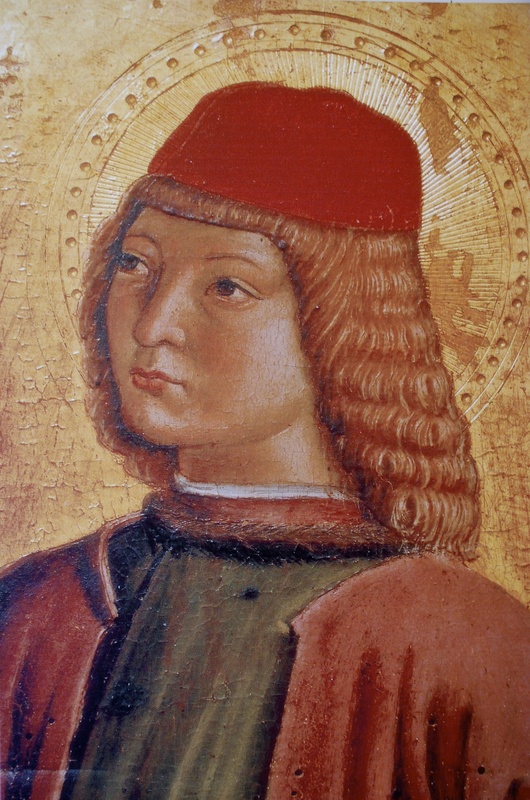 Gozzoli, a pupil of Fra Angelico, is best known for his wonderful frescoes in the Medici Palace in Florence. So, important art for a small town. 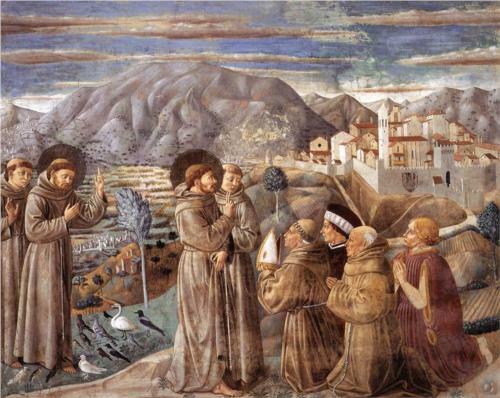 The detail below shows Saint Francis giving his sermon to the birds. There is also a Nativity fresco by Perugino as well as various paintings by Umbrian artists of the 15th century. It was well worth a visit. 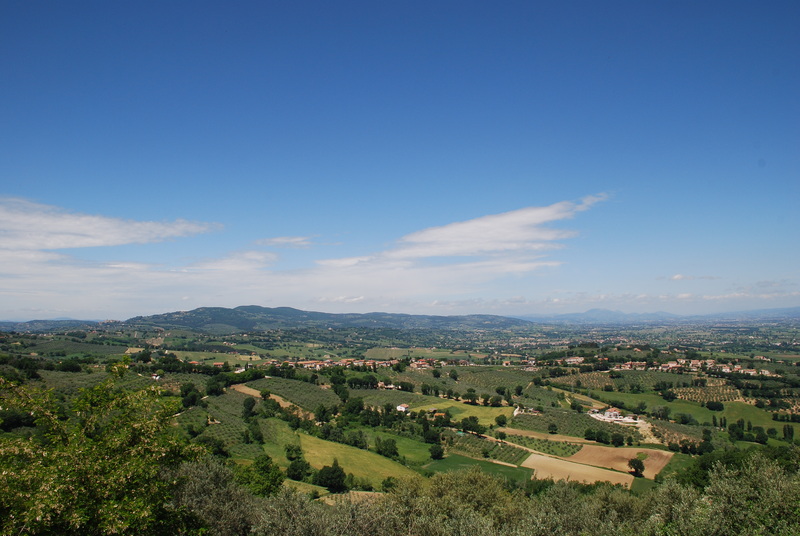 Continuing down the street, we reached a lovely piazza with extensive views across the Umbrian valley, vineyards, olive groves and mountains. 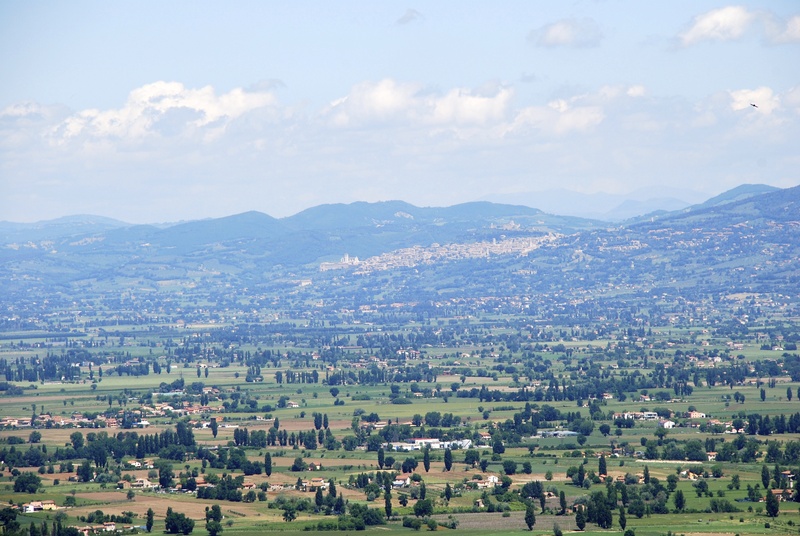 You can appreciate why Montefalco is known as the “Balcony of Umbria”. 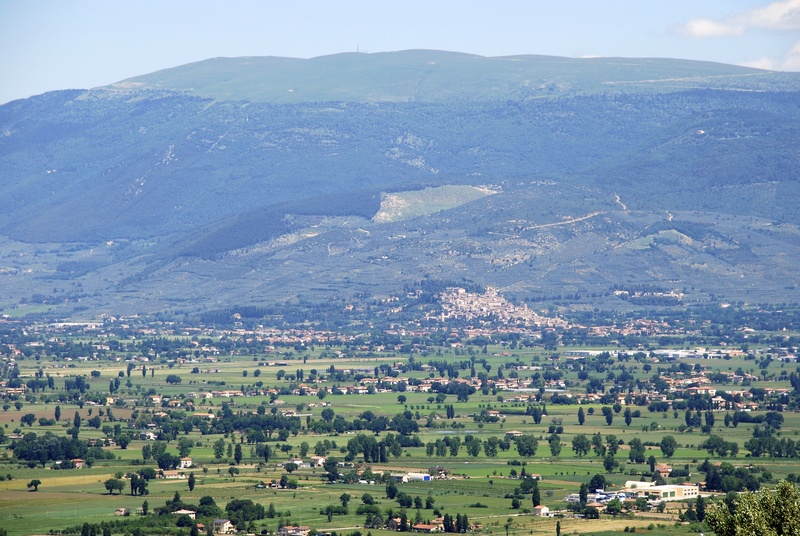 The photo below shows Spello in the distance, perched on the lower slopes of the mountain. 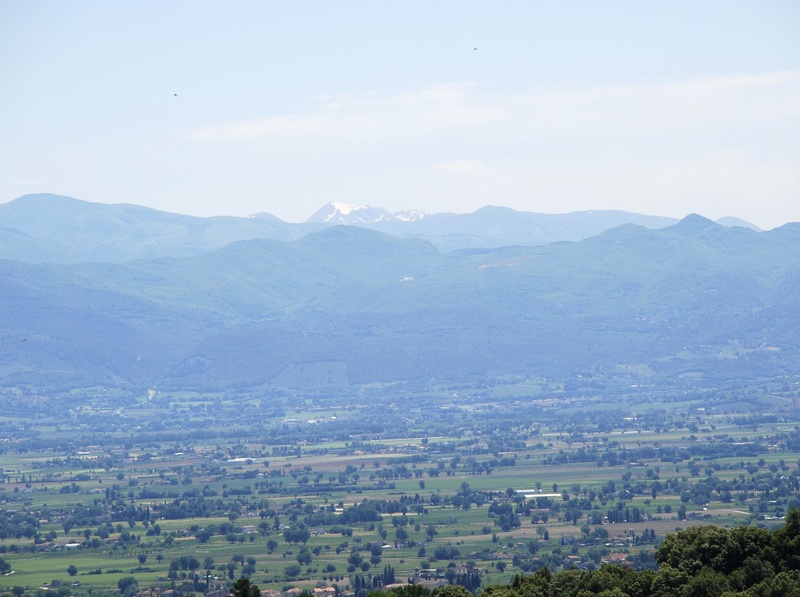 This photo shows Spello and Monte Subasio, the mountain we drove over (!!! 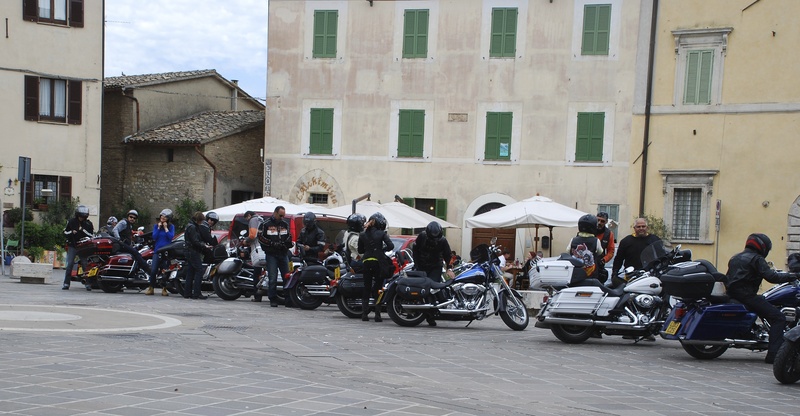 See earlier post Stairway to Heaven) to Assisi which is just out of shot to the left of the picture. You could still see snow on the highest peaks. Everywhere you looked there was something of beauty, like this detail of a painting on one of the old buildings. And a more modern poster advertising an exhibition. After all of that culture and fresh air, there was nothing else for it but to head for lunch in the main square. 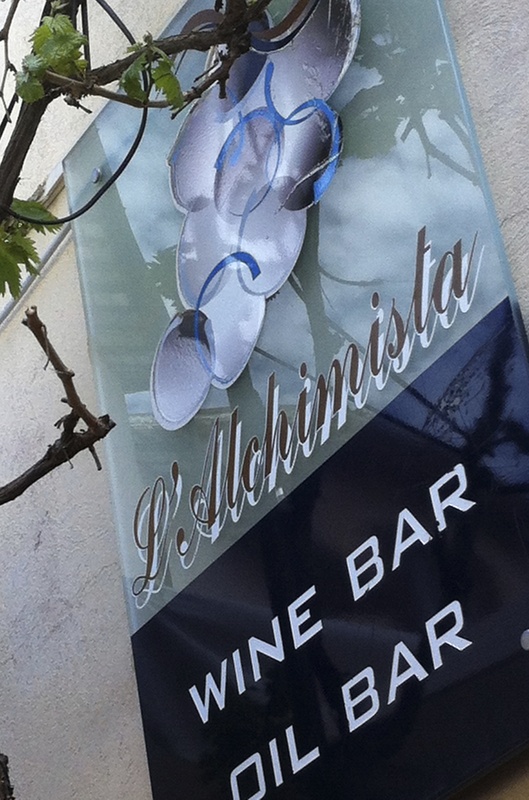 L’Alchimista had come highly recommended, and its tables were filling up fast. 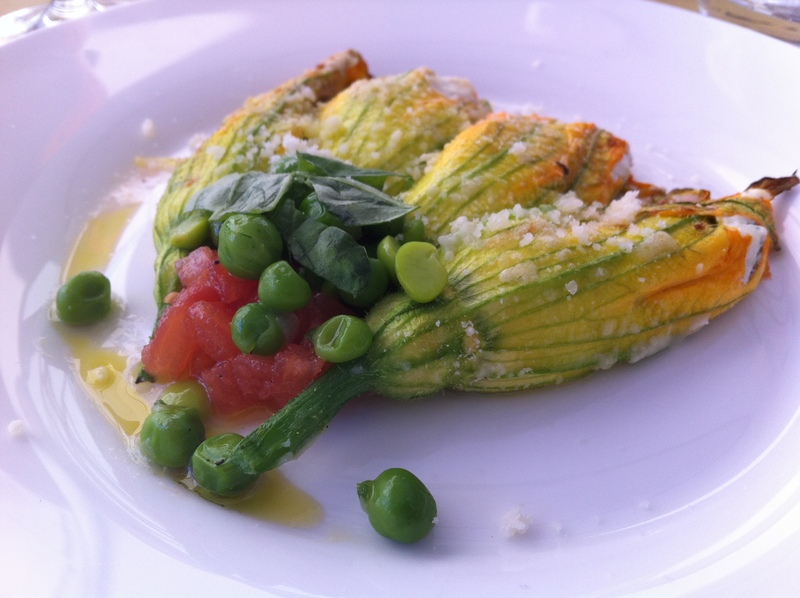 We started with zucchini flowers, stuffed with ricotta cheese. Not only did this look divine, it tasted heavenly too. It was, without doubt, the best dish I have eaten during our entire stay – and that is saying something! 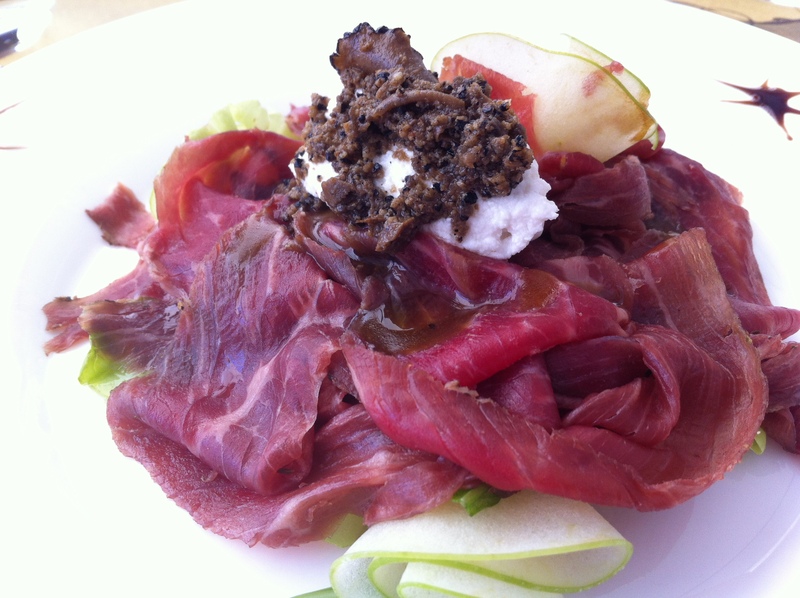 I followed up with carpaccio of veal with goat’s cheese and truffle…. 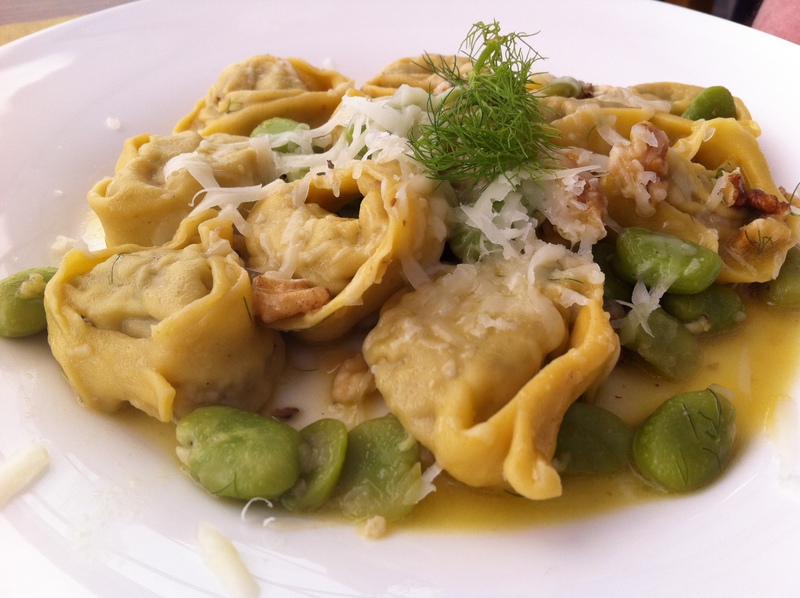 ….whilst mio marito settled on tortellini stuffed with porcetta and truffle with fresh peas and broad beans…. 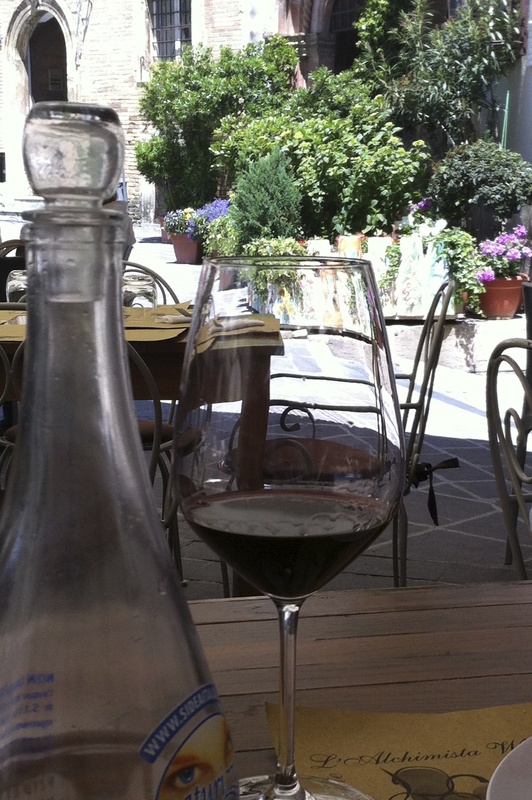 ….all washed down – inevitably – with a glass of Sagrantino di Montefalco. It was the most perfect lunch: local produce, zinging with flavours, beautifully prepared and presented. Just as we left, the local Harley Davidson Hills (as in hill towns) Angels arrived, the distinctive throaty thrum of their engines preceding them by a short handlebar. 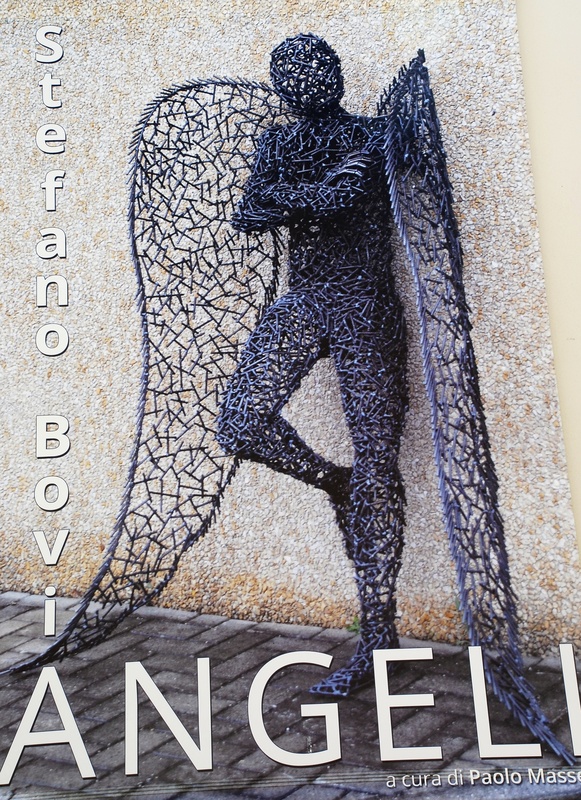 This entry was posted in Umbrian Art, Umbrian Food and Drink, Umbrian Hill Towns and tagged Benozzo Gozzoli, Montefalco, Sagrantino di Montefalco, Umbria on May 19, 2013 by maryshoobridge. Great photos….makes me want to get on a train! That stuffed tortellini looks incredible! Thanks. 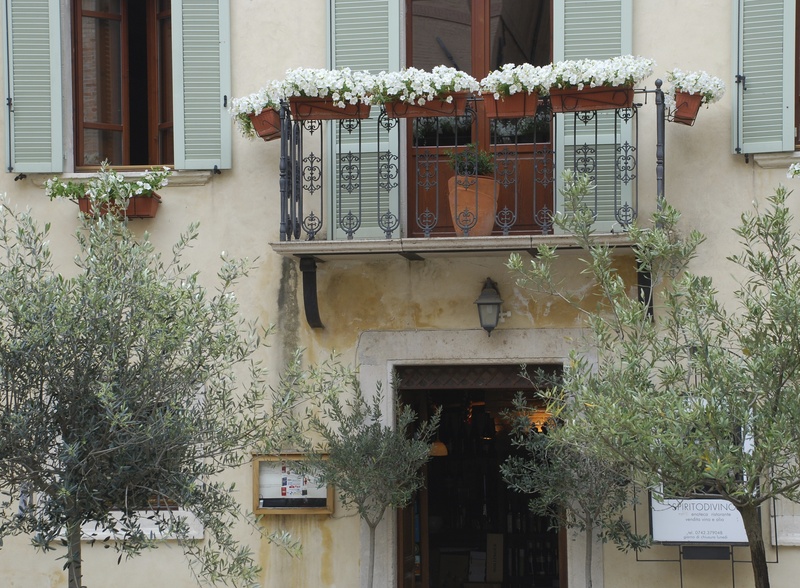 If there is one thing we have said we will repeat it is lunch at L’Alchimista. Who knows what magic mouthfuls they can conjure up! …another town we have driven past. Next time we will go there. I want those stuffed zucchini flowers! 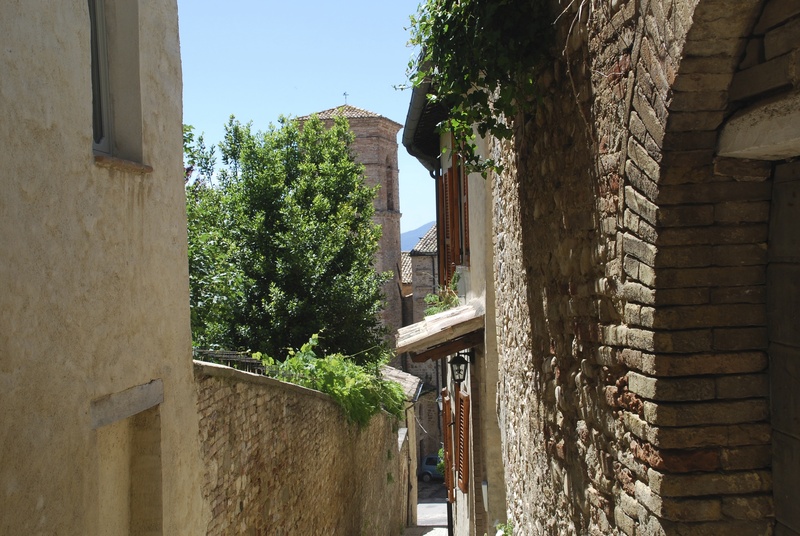 Oh do go – Montefalco is a tiny treasure. But go on a nice day to get the benefit of the views. Thank you. It was quite a revelation to find such beautiful paintings in the small church in Montefalco. A truly perfect place!